You might think it’d be easier to ask for something achievable in a campaign, rather than demand the impossible. But sometimes the opposite is true. 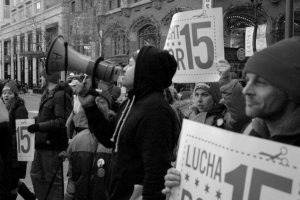 In the first episode of ChangeMakers podcast, we look at the famous Fight for 15 campaign in the United States, which is radically changing the way low-wage workers fight for better conditions. Then we look at the roots of the radical politics that is sweeping Barcelona – and examine their attempts to “empower the street”. Click the play button above to stream it here. Or listen to this episode on PodcastOne or Stitcher, or Apple iTunes. (Or use any Podcast app with our RSS Feed). HOST: That’s Robert Wilson Jnr, who used to flip burgers for McDonald’s. For years he got paid. HOST: $8.25 an hour. And so did the rest of his family. HOST: This is the story of how Robert decided that 8.25 wasn’t enough. But instead of arguing for 9.25 or even 10.50, he and thousands of his co-workers decided to campaign for $15 an hour. Almost double his pay. The movement’s called the Fight for 15. And it’s spreading across America, succeeding where literally hundreds of other campaigns have failed. And talking to the brand new organisers who’ve been leading one of the most effective challenges to Donald Trump. HOST: All of them, Changemakers. HOST: Before we get back to Robert and the Fight for 15, let me explain who I am. Like Robert, my first job was flipping burgers for McDonald’s. Since that awful experience, I’ve done a lot of things to try and make the world a better place. I started out by attending more than my fair share of rallies, holding placards, knocking on doors and signing petitions. Remember the large rallies around the globe against the War Iraq in 2003? Yeah — I helped organise one of them. When that didn’t work out so well, I tried to be more strategic. I co-founded GetUp, which pioneered digital campaigning in Australia and also set up a massive coalition called the Sydney Alliance, in my home town. At one level it’s great. The other day, my name got put on a meme, linking me to a world-wide Jewish conspiracy to take over the world. You know you must be doing something right when you’re on a meme? But recently, I’ve been thinking a lot about the impact my constant campaigning has had on myself, and those around me. I have literally sent myself to the brink of madness trying to make the world a better place. And for what? Look at the world in 2017. I’ve spent my adult life trying to improve the world, and this is the result? The thing is, change is possible. Victories happen everyday. You just don’t hear about them. So I’ve decided to do this podcast and meet some of the more extraordinary Changemakers. I want to find out what they’re doing, but most of all, how they’re doing it. HOST: The way I remember it, Fight for 15 had a pretty modest beginning. It was 2006, and I’d travelled across the world to research how Americans campaign. Madeline Talbott was one of America’s top organisers at the time. She and her husband Keith were organising a campaign against Wal-Mart – the largest retailer in the country. INTERVIEWER: What was it called? INTERVIEWER: “Would it be fair to describe your office as more functional than style? MADELINE: Yes is would be fair to say. Keith actually has a good story of Michelle Obama coming to visit … she was discussing whether to place a volunteer with local 880. And as they were talking, a cockroach started its way up the wall. It wasn’t pretty. HOST: Like Fight for 15, the Big Box campaign was about improving the lives of low wage workers. But for the campaigners taking on Walmart, there was a catch. MADELINE: (after muffle, what happened) They were hugely popular because of their discount pricing. HOST: Walmart’s stuff was so cheap that the company had genuine support amongst the very low wage workers that Madeline was trying to mobilise against Walmart. While this is annoyingly ironic, it was also a big problem for the campaign, and Walmart knew it. At every turn, the company tried to divide the community from the unions. Walmart presented itself as a friend to its customers – who were in many cases living below the poverty line, even while working full time for Walmart. The unions and the community organisations found themselves locked out. A new strategy was needed. So instead of focusing on Walmart they decided to take an industry-wide approach. They wanted all Big Box retailers to pay a wage that workers could live on, rather than just the minimum. And that would include Walmart. MADELINE: After talking to our members we felt that Wal-Mart could come to the city but if it did they should pay a living wage. HOST: A Living Wage. Instead of a saying “No Walmart” they developed a positive demand, complete with a social justice sting in its tale. Asking employers to pay a wage that workers could live on was a pretty reasonable demand, and had the added bonus of implying Walmart’s wages were so terrible, nobody could actually live on them. The plan was to pass an ordinance at City Council. It was perfect timing. It placed pressure on the whole Council in the lead up to their election. MADELINE: We ran a huge fight to win a standards ordinance and it was a huge coalition. HOST: Even though the mayor opposed the measure, they had won. HOST: and then… the Mayor vetoed it. HOST: They lost. The veto meant that the measure was dead in the water. But the campaigners didn’t see it that way. Madeline and her team had a hunch that the Mayor might veto the ordinance. That’s why they had timed the campaign ahead of the election. Their campaign had put the spotlight on the issue of low wages. For the Mayor to save face with voters, he now had no choice but to do something about the issue. So they offered the Mayor a way out. Instead of turning him into an enemy, they said to him, “Okay, you don’t want to deal with this at a city level, but what if you supported a state-wide increase to the minimum wage, which includes Walmart workers.” Essentially they were offering him the opportunity to make it someone else’s problem. MADELINE: To give you an idea of the impact of that, every dollar above the minimum that we could win is a $2bn transfer of wealth. That kind of increase was a transfer of $4bn wealth per year. It was amazing. HOST: Remarkably, they won. Eight dollars twenty-five. State-wide. But the campaign had hardly been a worker uprising. It’d been a clever piece of politics – with some sturdy coalition building – that allowed Walmart to set up in Chicago, in return for slightly higher wages. It showed the value of always thinking a few steps ahead. When the mayor vetoed the ordinance, they had a back-up plan, to leverage their position in the next battle. HOST: The following year, I left the US and went back home to Sydney, Australia. But I kept in touch with Madeline. The big box campaign had been hailed as a triumph, but it wasn’t perfect, and I was keen to see where it went next. I went away, reflected on what I saw, and wrote a book about it. Well — it was one of the case studies. HOST: So they decided to change tack. MADELINE: This time we wanted to build the campaign from the right base, from the base of the workers themselves. HOST: It was pretty cool. I’d written something, and they’d listened. And let’s be clear what was happening here: a community organiser heard a critique of her organising and didn’t get defensive! Instead Madeline worked with her team to think about how they could shift their strategy to take the criticism on board. Madeline quickly discovered that her Chicago team were not alone in wanting to organise differently. In 2011, this group of organisers came together and committed to changing the way they worked. Madeline was amazed to hear about what her colleague Jon Kest had been trying in New York. HOST: Putting the workers at the centre of the strategy. That was the key. HOST: Instead of paid organisers alone deciding what to do and then telling the workers, here the organisers and the workers jointly figured out how to try and win. HOST: Back in Chicago, Madeline decided to experiment with this model. One of the first things the workers decided was they wanted to hold a rally along Chicago’s Iconic Magnificent Mile. MADELINE: Going in and out of stores talking to workers as we went. HOST: That’s right. Instead of having a march and then listening to union staff make speeches, the rally that the workers planned went and talked to actual workers, as they were doing their jobs. And they didn’t just talk to them. They signed them up. Not to a union, but to the cause. HOST: It was a complete rejection of the normal union script. Hell, the workers, like Robert Wilson, even made up their own songs. ROBERT: (singing) 8.25 just ain’t fair, we started from the bottom, now we’re here. MADELINE: We had never done anything like that where we were recruiting workers as we went. HOST: Meanwhile, in New York, Jon Kest started organising in migrant communities and found the workers were pretty good at negotiating better wages for themselves. The powerful service workers union, called the SEIU, decided to back in these new organising efforts. It was the first time that a union had backed a campaign that wasn’t about signing people up to a union, but rather about building a social movement of low wage workers. Over the next year, organisers in Chicago and New York built up lists of tens of thousands of workers, who all wanted radically better working conditions. The next conversation was about identifying what their demand would be. MADELINE: Over and over again, the amount we were fighting for was fine but it wasn’t enough. $6.50 was fine but it wasn’t enough. $8.25 was fine but it wasn’t enough. HOST: So what would they aim for this time? An union staffer might have recommended that an extra $1 or $2 per hour was realistic. But it wasn’t up to union officials. It was going to be the workers together with the organisers who decided what to demand. MADELINE: We talked in Chicago about what the focus would be and … we said we think we should list an amount that people are ready to fight for. And somebody said, and it wasn’t me, what would you think of fight for 15? And I said, that is exactly the right level. I understood that working directly with the workers involved that 15 would be (both) aspirational (, something worth fighting for, ) it would not be something that we would win immediately but something that would be worth fighting for. HOST: At first some workers, like Robert, didn’t think it was very realistic. ROBERT: I was sceptical, and I was just like I’ll believe it when I see it. HOST: The idea was that the increase would be spread over several years. That way, employers could plan for it, while workers were guaranteed rising prosperity along the way. The demand itself was its own education. ROBERT WILSON: we’re working, and we’re working hard, but at the end of a day, we’re still not able to afford our basic needs. We still need food stamps. MADELINE: So we took the fight for 15 demand to the workers at the next fight for 15 weekly meeting. It just took off. ROBERT: so many people at times feel like where they’re at financially is based on their own individual failures. But when … you’re in a room with so many people who are going through your same struggle, it really shows how much this is a larger issue going on. HOST: This is key. By talking to each other they escaped their isolation and they were able to realise that their poverty wasn’t their own fault. The systemic underpayment of workers was to blame. INTERVIEWER: Did the $15 in particular mean anything to you in where you were at? ROBERT: Yeah. I thought that it would really be a big change in my life. HOST: So in Chicago they had another rally – this time on Black Friday – the busiest shopping day of the year. ROBERT: An organiser I remember… was like, “It’s okay. You don’t have to go in there. We wouldn’t recommend anybody strike at their workplace if they don’t want to.” And I remember just saying, feeling like if I didn’t do this, I feel like I wouldn’t win. It was a key moment in my life where I had to define it. HOST: And it wasn’t just in Chicago. Back in New York, a few weeks later there was a strike of low wage workers. Let me say that again. A strike of low wage workers: Workers who economists had been claiming for years couldn’t strike, because their labour was so readily replaceable. MADELINE: Their one-day strike at the end of 2012 made national headlines. HOST: So how did they do it? The first thing they did was they decided to ignore the law. But don’t take our word for it. This is Collin O’Malley, an organiser at the time. COLLIN: How did they stand up? Well one, they ignored the NLRB rules that meant to make unionising nearly impossible in this country. HOST: It’s no secret that the rules are stacked against unions in the United States. Even getting into a union involves complicated workplace ballots. But thanks to precisely those rules, this strike was not being organised by union members. These were just non-union workers who had signed up to support a campaign. And thanks precisely to all the anti-union rules, they had very little to lose. After all, what were the authorities going to do to them? Take away their paltry pay? They couldn’t even threaten to deregister their union. Because. It. Didn’t. Exist. MADELINE: …they were mothers and fathers who had to pay bills. The concept that they were prepared to risk by going on strike was such a hugely resonant concept. HOST: The law breakers: they weren’t just young, hopefuls. They were lifelong employees. Jonathan Westin was one of the New York organisers at the time. JONATHAN WESTIN: We were literally thinking that every single one of these workers could get fired. And you know it was very likely that a lot of them were going to get fired. HOST: This wasn’t a tale of the unions cutting deals to try and get an extra few bucks in return for more members and concessions. This was unleashing the talents and energies of everyone it touched. And, remarkably, instead of being fired, they set in motion a national movement called Fight for 15. MADELINE: The slogan came out of Chicago the tactic came out of New York and the backing for this came out of SEIU. …And the rest is history. HOST: Seeing a winner, the SEIU ended up putting tens of millions of dollar into the campaign. Within a year of that first strike, Fight for 15 won a commitment to a $15 minimum wage for all workers in New York, in California, in the city of Seattle and in more than a dozen other cities and counties. And now the Fight for 15 team are going after the largest fast food employer in America – McDonalds – to get them to pay $15 an hour. They have made the impossible possible – almost doubling the wages of millions of people across the country. How did they do it? They put workers at the centre of the campaign. It almost seems embarrassing having to say it out loud. Isn’t it obvious that workers have the most to win in a fight for their own conditions? Sadly staff-controlled campaigns are all too common across unions and community groups. Paid professionals come in and write the strategy and then ask their army of members to turn out to moments of action. In fact, that’s the usual way of doing it. The weakness in the original fight against Walmart was that the union was distant from the workers, allowing Walmart to play up that division. By involving workers and experienced organisers in the development of strategy they built a much, much more powerful army. It took longer, and they had to convince people like Robert to overcome their initial skepticism. But the end result was worth it. It’s taken on a life of its own. Indeed, with workers involved, the demands themselves became so much more inspiring. The workers didn’t have a technocratic bit-by-bit approach asking for one dollar here and a dollar twenty-five there. An extra dollar an hour wasn’t going to solve anyone’s problems. But a big bold demand like $15 was big. Change your life big. Make the impossible possible big. ROBERT: We really opened people’s eyes to a $15 minimum wage at a time where people thought we were crazy to say things like that. HOST: Welcome back. This next story is the housing equivalent of flipping burgers for 8.25 an hour. HOST: Imagine, you’ve just been told that at any moment – day or night, you could be evicted from your home. No notice. How would that make you feel? JAMES: One day, I was talking with my neighbours, and I said, you know, I’m, I’m not sleeping very well. HOST: A few months ago, James apartment building was sold off. JAMES: And they were like, no, no, neither us. HOST: It was 3:30 in the morning. He texted around his building to see who was awake. HOST: It’s not a large building. 11 apartments in central Barcelona. All lying awake, thinking about what might happen. JAMES: … it affects a lot to our healths. It starts with, you know, problems with…that you’re not hungry, and then problems with going to sleep too, of course. HOST: Today I’m in Barcelona. …This is a story about how a city’s citizens decided to stop worrying about the interests of those who owned it and instead pay attention to those who lived there. INTERVIEWER: And today we won. UW: Yes feels so good… I want to cry you know, the emotion. HOST: It’s pretty extraordinary story, and amazingly, it’s a movement that’s still growing. HOST: May 15th, 2011. Thousands of protesters flood the Plaza Cataluña in Barcelona. That faint whacking sound you hear above the shouting. HOST: There? That’s the sound of a woman in her mid-twenties, with denim jeans and a green t-shirt sitting in the plaza, being beaten with a baton by a heavily armed police man in riot gear. Everyone around her looks on in shock as she clutches her leg in agony. HOST: On the 15th May 2011, 130,000 indignados – or in English ‘the angry ones’ – took to the streets, camping out in town centres across the country. HOST: Why were they so angry? It all starts back in 2009. A few months after the American financial system had collapsed the world entered the so-called Global Financial Crisis. Spain’s economy tanked, but instead of supporting the economy, the Spanish government supported by the Spanish opposition slashed its own spending, driving a pretty bad recession into a full on economic depression. The government called it ‘austerity’. Which sounds harmless enough, sensible even. But millions lost their jobs. LUCIA: The people that could not pay, they just selled the apartment and that was over. HOST: But now, millions of people couldn’t cover their mortgage, and nobody would buy their property. The economists in Brussels called it a housing crash. But that hardly begins to describe it. It was a catastrophe. Lucia Gonzalez lived in Barcelona, and had lots of friends who were affected. LUCIA: no one knew what happened when you were not able to pay your mortgage. HOST: One person who faced this nightmare was Mari-Carmen. Her troubles started when her daughter was struggling to pay her mortgage. So Mari-Carmen agreed to guarantee the loan. MARI-CARMEN: They offered her a loan that was a hoax. Nothing but a hoax. But we didn’t know that. HOST: Within six months, struggling to pay, the banks came in and took her daughter’s home. With nowhere to go, Mari-Carmen let her daughter and grandkids stay at her house. Unfortunately, that wasn’t the end. You see, with Mari-Carmen’s guarantee, the banks now started pursuing Mari-Carmen for her house too. They announced their intention to evict Mari-Carmen, and her daughter and grand-children. HOST: By 2010, there were hundreds of evictions like this occurring across Spain every day. Seeing this, Lucia and her friends decided to hold a meeting about the issue. They put up some posters around the city. 50 people turned up. LUCIA: all of them were like, …we’re here together but all of us has one problem so we want a solution for our problem. HOST: They formed a group, called La PAH – the platform for people affected by mortgages. It struck Lucia in the first few meetings that all the people turning up seemed to feel ashamed. LUCIA: All the public voices and this…were saying, this is your fault. I mean, if you have a mortgage, it’s because you decide to have it. HOST: Carlos Macias [PRON: Mathias] was one of the organisers at La PAH meetings, where people would share their stories. CARLOS: People arrive feeling guilty. It was my failure. It was my fault. …So we discovered that the first one that we have to do was generate…assemblies where there is a, an emotional empowerment. Where you take out this guilty, you…you understand that you are a victim of the bigger scam, the structural failure that is not your fault. HOST: Just like in the Fight for 15, talking it through together made people realise the problem was systemic. The banks had scammed borrowers, and the law allowed it. It was the law that needed to change. HOST: By now it was 2010. For a year, Lucia had been organising with La PAH. Every day, hundreds of people were being evicted across Spain. People were coming to the meetings, but Lucia and her friends felt like they were on a treadmill. They were helping people through their misery rather than doing anything to stop the pain in the first place. HOST: The group talked about it. It struck them that both major political parties – the Socialists and the conservatives – weren’t doing anything to stop the evictions. It was up to them to stop it instead. LUCIA: We told them, talk to your neighbours. Tell them we are going to be there on this day. And tell them that they have to help you. HOST: The day of the eviction came. LUCIA: And then we took a… a camera to tape it. … and then 2 Mossos, which is the Catalan police, came there. And they saw all these people. HOST: In the video, a representative from La PAH talks calmly to the police. LUCIA: Yeah, we’re here. We’re going to stop this eviction. …And you have to decide what to do because we are staying here…. and the police was like, hmm, we don’t know what to do now. HOST: It was by no means a huge crowd. Perhaps 20 people with signs, and some neighbours. There are some old people milling around in support – locals. LUCIA: And they were kind of, I don’t know, they didn’t know what to do and they just leave. LUCIA: This was our first victory. INTERVIEWER: Did they try again? LUCIA: Yeah, they tried again and again. Because this is what the law allows but we…At the end, at the end, we stopped it. But….Our first, our first…victory was this and we put it on the internet. And it went viral. HOST: The lesson was clear: To protect citizens from the system, bold direct action was required. But that could only happen once people had talked it through with each other, and come to the conclusion that the whole system was rotten. After all, most people aren’t naturally inclined to disobey the law. And those who participated weren’t just fighting on behalf of one deadbeat borrower. They were fighting for justice for everyone in this position. Like with Fight for 15, the sheer ambition made it easier to organise. People could see how they could solve a real problem, not tinker at the edges. But like all tactics, the direct action that La PAH was engaged in had a shelf life. When the bankers started knocking on her door, Mari-Carmen, who guaranteed her daughter house, enlisted La PAH’s help. MARI-CARMEN: There were three attempts at eviction that were stopped by la PAH. HOST: Every time the banks told Mari-Carmen they were going to evict her, La PAH would stand in the way, and physically prevent the eviction. So the bank changed tactics. Under Spanish law, they weren’t required to name the date of the eviction. So they didn’t. They just told Mari-Carmen that they would evicting her at some point in the next three weeks. It was a despicable kind of purgatory. MARI-CARMEN: You can imagine. I was unable to sleep, I couldn’t do anything. HOST: With no notice so La PAH wasn’t there. …Then I decided to open the door because I had my 3 grandchildren sleeping and my daughter also. (Crying.) And so that they wouldn’t be more scared I opened the door. HOST: Her grandchildren were 12, 9 and 6 at the time. CARLOS: took the children from the bed and they give them 5 minutes to pick up their things. HOST: There are so many ironies in this story, but the fact that the Spanish government refused to help victims in the housing crisis is one of the more galling. And it’s one that was not lost on Carlos Macias, who became involved in La Pah around this time. You see, under Franco it was the government who first started encouraging everyone to buy their own house. CARLOS: He said we must make Spain … a country of ownership… If you have a mortgage for 30 years, … you are not going to be able to make revolution or go to strike. HOST: He wanted Spain to be a nation of owners, and that idea was supported by every subsequent government. It was a kind of unspoken guarantee underwritten by the entire political class. CARLOS: They say … You never will lose with a, a mortgage, with a property. CARLOS: half million of families has been evicted in 7 years. HOST: it undermined a key narrative the government had been telling everyone about itself. But that’s not the only irony. In 2009, the government had quickly swooped in to help another group affected by the crash. CARLOS: An average of 184 evictions per day. HOST: Per day. Still wonder why they were called the Angry Ones? HOST: May 15, 2011. 15M – a day designed to unite the indignados from around the country. Inspired by the Arab Uprising, the idea was to fill plazas across Spain to protest against austerity policies that both sides of politics were supporting at upcoming elections. Essentially it was a protest march against all the major political parties. PROFESSOR JOAN: 15M is not a movement. Because if you arrive here in Barcelona or Madrid and you try to connect with 15M, there is no one movement. There is no speaker. There is no address. There is no phone number. HOST: That’s Joan Subirats, a professor of politics at the Autonomous University of Barcelona. PROFESSOR JOAN: Is not, it was not a movement but an event. HOST: An event organised almost entirely through online social networks. Its slogan: we are not commodities in the hands of politicians and bankers. PROF JOAN: No political party, no trade union was involved in the process. …there was no flags, no classical flags, no red flags, no Catalan flags, no flags on the square. CARLOS: You need to go out and, and try to provoke a revolution or something. HOST: Those in power were seriously rattled, to the point where in Barcelona, the government, after 12 days of occupation, ordered the protesters be removed from the square by force. 350 police in riot gear, backed by 100 so-called urban guards. HOST: But every time the police moved protesters on, they kept coming back. Over the ensuing month, more than 70% of the city’s population participated in the protest. 70%. Naturally, La PAH were there. But unlike almost everyone else, they turned up with a plan. And it was anything but timid. LUCIA: For us it was like … the perfect storm. HOST: Under Spanish law, if La PAH could get enough signatures, they could petition the national government to rewrite the laws in favour of citizens, rather than banks. It was an electric idea and it gave the Indignados something solid to try to achieve. They needed half a million signatures. CARLOS: we achieved 1.5 million because thousands of people every day for 9 months, informing the people, to the people which was the problem, which were our proposals of our solutions. INTERVIEWER: Can I ask, was that all done on the streets? INTERVIEWER: So not, no, not using technology? INTERVIEWER: Oh, sort of mass conversations. HOST: I just want to take a moment to draw something out. While 15M was organised mainly online, La PAH was mainly offline. And it explains why the demand was so bold. It is hard to overestimate the value of talking face to face with other people to make you feel like you can achieve anything. CARLOS: Because it is a collective problem so we must fight collectively. HOST: So they went broad – their petition allowed them to talk to literally millions of people – to raise awareness about evictions and how this problem could be solved. But they also went deep. With a smaller number of highly committed people, they proceeded to take increasingly risky direct action stopping evictions. This was another key to making La PAH’s members feel like anything was possible. LUCIA: this empowerment feeling was there and then people that was going to be evicted could say it. Could fight it. HOST: So Carlos and Lucia and their growing team of people took the petition to the government. 1.5 million signatures. A million more than they needed. And they said — here is the petition. And they pointed to polling which showed that 90% of Spanish voters supported the demands. Then, one of the most prominent leaders of La PAH, Lucia’s good friend Ada Colau, got invited to address a parliamentary commission about their proposed changes to the law. HOST: A man in a grey suit speaks before her. He tells the committee there is nothing wrong with the current system. He’s a banker. Then the camera turns to Ada Colau. LUCIA: And this went viral. CARLOS: That moment the opposition of the government was not the Socialist Party, was not another party, was LaPAH in that moment. HOST: La Pah was the opposition alright. But they weren’t just the opposition party. They were in opposition to the entire political class. All the major parties opposed La Pah’s proposal, even the socialists. The government refused to debate it in parliament. HOST: … then went one further, sending in the police to break up a protest La PAH had organised. CARLOS: So they start to criminalize us. They say that we were terrorists. HOST: It was a devastating blow. Political parties of all stripes had failed them. LUCIA: So these kinds of organizations wasn’t the solution. CARLOS: But we couldn’t stay a lot of sad or angry because next day we have an eviction. HOST: Months passed. Perhaps the government was expecting La PAH to fade away, but the evictions continued, hundreds a day, and La PAH continued to get in their way. So Carlos and Lucia and all the people protesting against evictions decided to try the same idea – a petition to change the law – this time at a local level. CARLOS: So we started to do the same process, Popular Initiative Legislative, here first in Catalonia, in the parliament. HOST: They gathered the signatures. And this time they won. The law changed. In Catalonia, at least. HOST: It was as transformative as the Fight for 15. The law said that anyone who is trying to make money out of housing is trying to make money out of a human need. And as a result, owners can’t just do what they like. CARLOS: So you cannot be evicted, not mortgage, no rent, no…no squat. You are forced to…forgive the debt to the family. To the suppliers, say: You cannot cut water, electricity to family that cannot afford. And you must… carry with…with the cost of that. HOST: Pretty radical stuff. Over the first nine months of the law, it had immediate impact. CARLOS: it was more than 30,000 suppliers cuts were avoid. Thousands of evictions were stopped. HOST: Across the city — people were at last able to sleep at night. They no longer lived in constant fear of eviction. HOST: So what did the national government do next? CARLOS: appealed to the constitutional court and they suspend our law. HOST: I know. Amazing, right? The national government intervened to allow the banks to get on with evicting people. It was almost like the entire representative arm of Spanish politics had forgotten who they were supposed to represent. They were now going out of their way to put their own citizens onto the streets – and make them homeless – all to protect the interests of global finance. As a changemaker, how do you work with that. It must have felt impossible, right? HOST: For La PAH, it was a breaking point. Lucia, Ada Calou, Professor Subirats and a few others decided they had to rethink their strategy. Again. LUCIA: We had this big power in the street but the institutions were kind of closed. HOST: And they started to think about the one institution that had let them down at every turn: political parties. HOST: Many in La PAH believed that joining a party wouldn’t solve anything. And for good reason. LUCIA: This was not a good solution. HOST: They had long seen what happened when parties absorbed activists and turned them into sellouts. LUCIA: A person couldn’t change… anything in an old structure. HOST: But more than that, the parties who did agree with what La PAH were saying were, to put it bluntly, losers. They were fringe parties, who never won elections. And La PAH weren’t losers. They were playing to win. So Lucia and Ada Colau decided that it was time to reconceive what a political party was. Their aim: to create a truly radical party, that would rewrite the fundamental relationship between property owners and residents – and actually win. HOST: These people knew how to organise. They had friends on every street corner who had been through evictions and won. And they knew the issues that people cared about because they’d been living them – day and night – for the past six years. Now they turned that organising capacity to the task of mobilising votes. Just ten months after deciding to set up their own political party, running for the first time ever, under the name Barcelona en Comu, Ada Colou won the mayoralty of Barcelona. It was a stunning repudiation of the political class. ANCHOR ON TAPE: A long time activist has just been elected mayor of Barcelona, becoming the city’s first female mayor… Ada Colau has vowed to fine banks with empty homes on their books, stop evictions, expand public housing, set a minimum monthly wage, force utilities to slash prices, and slash the mayoral salary. ANCHOR ON TAPE: She’s been arrested repeatedly for her protests. I spoke to Ada Colau last week. Were you surprised by your victory? But partly it was not surprising because there is a strong popular movement and a strong desire for change. HOST: Lucia was also elected to the National Spanish Parliament. But remember, Lucia had always thought political parties swallow activists and turn them into sell-outs. So what did she think now? HOST: To make sure they remained connected to the people who got them there, Ada Colau committed to a listening campaign. LUCIA: Every 2 weeks… she went on Fridays to one of the neighbourhoods of the city with an open meeting. …maybe 2,3,4 hours were neighbours asking what happened with this … and she is like if I cannot do this, I’m lost. HOST: And that commitment seems to have paid off. In keeping with her roots, Colau started off her term by taking on global financial capital, fining banks who refuse to rent out vacant properties. HOST: It’s an inspiring story but not everyone in La PAH believes that a shift into party politics is a panacea. CARLOS: if there is not social movements, there is not mobilisation, you can have the best congressman or politician or mayor that without mobilisation is not going to be able to change. HOST: Carlos is underselling La PAH there. They don’t just mobilise people, they organise them into small groups with deep connections to go out and stop evictions regardless of what the law says. That’s something that’s very hard to do once you become a law-maker. But representative politics with the power of organising and mobilising behind it — keeping it honest? That’s when anything becomes possible. CARLOS: Because if you want to change the things… you can only do that if behind you there is people … demanding these changes. HOST: Lucia and Ada Colau realised that without representation, all the organising and mobilisation in the world wasn’t enough. But conversely, Carlos believes that without people power behind them, representatives lose their way. And who knows, Carlos might have a point. Ada Colau promised 80,000 new public homes when she came to power. As of October 2017, her efforts have stalled at just 3,000. HOST: Remember La PAH’s petition that was supposed to change the law, to prevent evictions? It remains off the table, struck down by Spain’s highest court. But Carlos and his friends in La PAH who decided to stay outside of party politics remain undeterred. INTERVIEWER: It surely shows the tension, the difficulty. You can win some stuff at a city level but you can’t win everything. INTERVIEWER: So you are organizing locally to change things nationally? HOST: Either way, you get the sense that this story isn’t over. The lesson, though, is already clear. Sometimes the first ingredient to achieving change is getting people to believe it’s possible. In Barcelona, and in the Fight for 15 — that wasn’t an easy thing, because the change most worth doing seemed impossible. Even the organisers of La PAH and Fight for 15 didn’t quite believe they could achieve what they were attempting. They had audacious goals – which made the movements immediately appealing. But we’ve all seen bold ideas that never go anywhere. Political parties are expert at that trade. Remember Obama? The audacity of hope? What made La Pah and the Fight for 15 different, is that they had something no political party has. They had engaged people in direct collective actions that made people feel powerful. Impossible goals then started to feel plausible to those involved. In Barcelona, the very act of preventing a man and his son from being evicted, allowed those involved to imagine possibilities they hadn’t even thought about. They started out as a support group and now they’re challenging the very idea of property ownership. In the US, the Fight for 15 wasn’t a fight for higher pay. It was fight for social justice, that could only be achieved through higher wages. And they did it themselves, using their own tactics, without a formal union structure. HOST: We dedicate this episode to the memory of Jon Kest, the brains behind the Fight for 15 movement in New York. He sadly died of cancer only days after the 2012 strike. HOST: Changemakers is hosted by me, Amanda Tattersall. It is produced by Caroline Pegram and Catherine Freyne. Written by Charles Firth. Our researchers are Tessa Sparks, Iona Rennie and Amy Fairall. Our audio producers are Uncanny Valley and our sponsoring organisations are Mobilisation Lab, Australia for UNHCR, GetUp.org.au, the Fred Hollows Foundation and the Organising Cities project funded by the Halloran Trust based at the University of Sydney. Remember to subscribe to this podcast to catch all our episodes, like us on Facebook at changemakers podcast and checkout changemakerspodcast.org for transcripts and updates on all our stories.